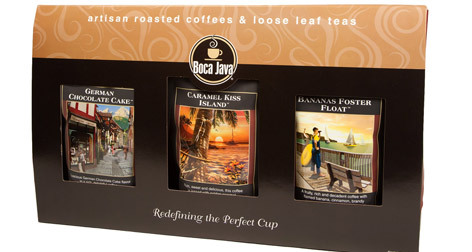 Our gourmet coffee gift boxes are the perfect gift for any coffee lover and easy for the coffee giver. Each coffee gift box includes 3 bags off coffee in a window display and can be given as is or easily wrapped. We have every combination, so no matter if the coffee lover in your life loves single origin coffee, flavored coffee or coffee blends, we have them covered. We also offer a Build Your Own 3 pack so you can share your favorite coffee. Give a gift they will remember, give the gift of fresh roasted gourmet coffee.